Sauro & Bergstrom has teamed up with The Food Group – Minnesota’s local food bank. For the next month we will be collecting non-perishable food items and monetary donations for The Food Group. Your generous donation will help to provide healthy foods and critical support services to more than 200 local hunger relief agencies, such as food shelves, on-site meal programs and culturally specific meal programs. For an ever-increasing number of local families, securing healthy and nutritious food year-round is a struggle which forces many to choose between having enough food and paying rent or mortgage. In fact, the number of our elderly neighbors who must regularly choose between purchasing their medications and eating throughout the month has risen to alarming numbers! EVERY DONATION MAKES A DIFFERENCE! 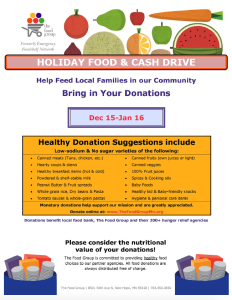 You can donate via this link or stop by our office between 9-4 with your non-perishable food items and help make a difference in the lives of local families who need our help the most.